Dukane has announced an ultra-short-throw LCD projector that can be positioned as close as 4 inches from the projection surface. 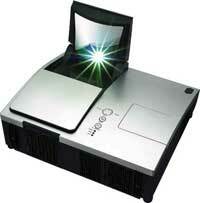 The ImagePro 8102 can be mounted above or placed below the screen. The ImagePro 8102 offers a brightness of 2,000 lumens and a resolution of 1,024 x 768 (XGA). It also offers a feature not often found in short-throw projectors: integrated 7-watt speakers. The projector also includes RJ-45 connectivity. The ImagePro 8102 sells for $1,795. Further information can be found here.